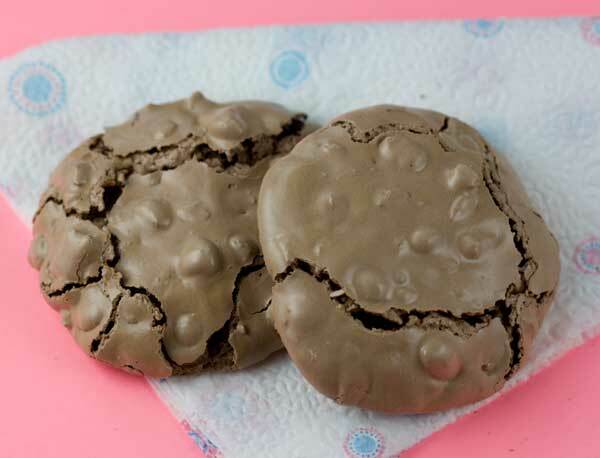 Chocolate Hazelnut Chewies are similar to meringues, but a lot quicker to make since you don’t have to dry them out for a long period in the oven. These chocolaty, nut and egg white cookies can be made with your favorite nut. My earlier version uses pecans and the ingredients are basically mixed in the bowl then beaten resulting in a somewhat thinner, softer, cookie. In this version, the egg whites are beaten until soft peaks start to form and then dry ingredients are added. The egg whites still collapse as you add the dry ingredients and nuts, but they puff up again in the oven. These are not as light and billowy as meringues and the centers are definitely chewy, whereas with meringues you can make the centers chewy or dry them out. If this is your first time making them, I recommend starting with a half batch just to make sure your oven temp is in line with mine and that the directions work for you. Chewy chocolate cookies made with egg whites, nuts and powdered sugar. Stir powdered sugar, cocoa powder, and salt together in a small bowl. Place cold egg whites in very clean metal or glass mixing bowl. With an electric mixer, beat until the egg whites are just past foamy and soft peaks are just beginning to form. Add the sugar mixture gradually (but not too gradually – a couple of tablespoons at a time is fine) and continue mixing on medium and scraping sides of bowl. When dry ingredients are completely blended, beat for exactly two minutes. Mixture will thicken slightly, but it will not be light and fluffy like meringue. Stir in nuts and chocolate chips (if using). Working quickly, drop heaping tablespoons of batter onto the baking sheets – try to keep them as tall as you can, but if they spread that is okay, spacing about 2 1/2 inches apart. Bake the cookies on the center and lower rack for 10-12 minutes or until dry, puffed and cracked on the surface. If you like your cookies with very soft centers, take them out and let them cool. For slightly dryer (but still chewy) centers, turn off the oven and let the cookies sit in the “off” oven for 20 minutes, them remove from oven. I have made a ton of meringues over the past few weeks and through trial and error, found that organic eggs worked better than regular eggs. Interestingly, room temperature and non-organic egg whites beat into peaks quickly, but didn’t hold up as well when sugar was added. Cold egg whites and organic egg whites took a few seconds longer to beat into peaks, but were more stable when additional ingredients were added. In this recipe the mixture will still collapse a bit when you add the sugar, but when the nuts are added it should still be thick enough to stay in little piles on your baking sheet. These are going on my list to try as well! These look great! Definitely on my “to try” list!